Photo Caption: Boyd Exel (AUS) was in top form in Hannover (GER) where he won the first leg of the FEI World Cup™ Driving’s 12th season ©Rinaldo de Craen/FEI. Four-time FEI World Cup™ Driving Champion Boyd Exell (AUS) had an excellent start of the FEI World Cup™ Driving’s 12th season in Hannover, Germany this weekend. Exell and his team of horses were in top form and they performed as if their last World Cup competition had taken place only last week and not eight months ago at the previous season’s Final held in Bordeaux (FRA) in Febuary. Exell won the opening leg in Hannover ahead of IJsbrand Chardon (NED) and Tomas Eriksson (SWE). Boyd Exell drove a very fast and clear first round and challenged Chardon who followed him in the arena. Chardon drove his team of Lipizzaner horses at high speed throughout the course, but had one knockdown and was unable to beat Exell’s time. Tomas Eriksson did the same and finished just behind Chardon in third place. Both Eriksson and Chardon knocked a ball down in the Winning Round, which gave Exell an advantage of approximately 12 seconds. The Australian drove his team magnificently round the course and even changed routes in the first marathon obstacle in order to go faster. In the last part of the course, he went at such a high speed that he unexpectedly cut a corner and drove his horses through the marathon obstacle to the last gate. This made the many enthusiastic spectators explode with joy and Exell was loudly cheered as he crossed the finishing line having scored a clear round. He was declared the winner and was presented with a special saddle chair, which was offered to him by the sponsor of the FEI World Cup™ Driving in Hannover, Klingenberg exclusive furniture. It was all a matter of preparation. Exell finished fourth in the first competition on Saturday evening and took his time on Sunday morning to prepare his wheeler and leader horses well for the World Cup competition. Boyd drove an experienced team of horses including the 20-year old leader horse Bill who will now get a rest until the Final in February 2013. IJsbrand Chardon’s horses are fast but they keep knocking balls down which sets the team back. Chardon has been training with a new Lipizzaner at home for the past three weeks and wanted to drive it in Hannover in order to test the speed of the team. But the horse was injured only a few days before the start of the season and Chardon has had to postpone the test. 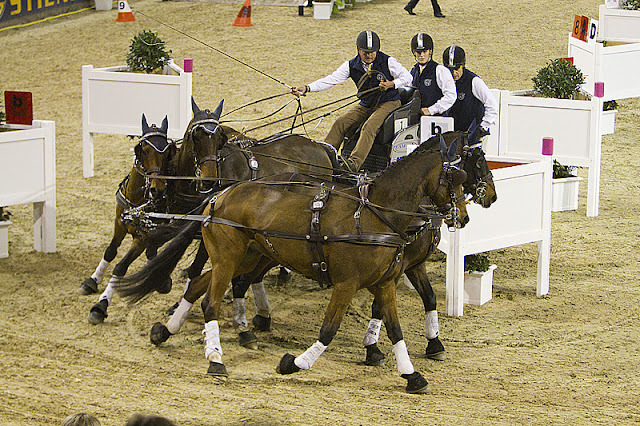 The Dutch driver was nevertheless pleased with his horses and left the arena feeling good. All drivers agreed that the course in Hannover, designed by World Cup course designer Dr Wolfgang Asendorf, was very tricky. The top favourites had all several knockdowns on the first night and Asendorf decided to slightly modify the course to make it more fluent. Tomas Eriksson, who was the first one in, was informed only a few minutes before the Winning Round that the course had been shortened. This change made a top performance difficult. Eriksson did his very best but knocked one ball down and finished in third place. Wild card driver Daniel Schneiders (GER) won the first competition on Saturday evening, but it did not go so well for him today. He knocked over an element in the marathon obstacle and had several knockdowns, which caused him to finish in sixth place. “I have a lot to learn,” said the former pony pair and pony team driver afterwards. Koos de Ronde (NED) was unable to get his horses into the right rhythm and came in fifth, ahead of World Cup newcomer Georg von Stein (GER), who is using some of his outdoor horses.